Out with the old, in with the brew! The Bonavita Connoisseur improves on Bonavita's classic coffee maker design with some much-needed ergonomic updates. 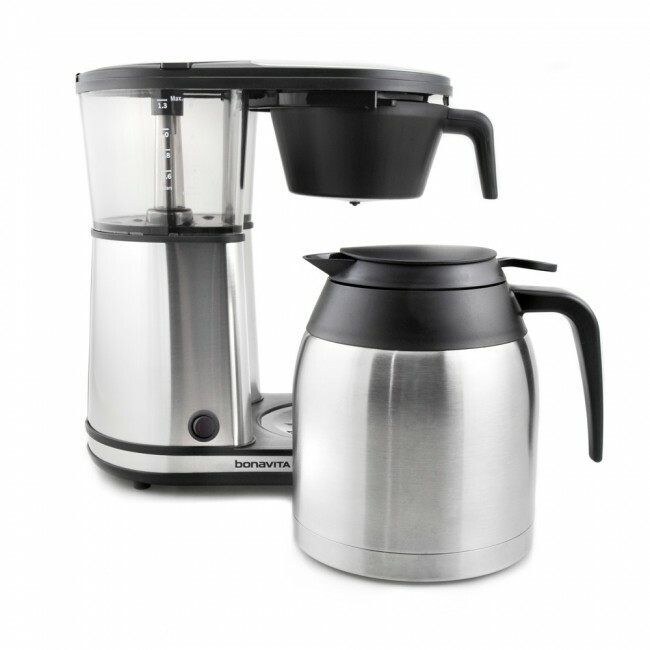 A new-and-improved version of the BV1900, the Connoisseur adds a machine-mounted brew basket and a stainless steel carafe redesign that promises to help get every last drop out of your pot between brews. Aside from these ergonomic expansions, the Connoisseur also offers better heat retention (thanks to the new basket design), an automatic bloom option, and simple, one-touch operation. Just Right Heat - Set to brew at a gold-cup standard 198° to 202°, your coffee will come out piping hot and ideally extracted every time. On-rails Basket - The addition of basket rails under the shower head of the brewer means better heat retention and easier pouring. New Carafe - Speaking of easier pouring, the lip shape of the insulated carafe is redesigned to be less messy when poured without the lid. Stainless Case - The Connoisseur continues with Bonavita's classic stainless steel cladding. Optional Pre-infusion - A simple press-and-hold of the toggle switch lets you set the Connoiseur to include a short pre-bloom stage before regular brewing. Spray Arm and Basket - The wide, level-adjustable spray arm and flat bottom basket help to soak every last ground evenly. 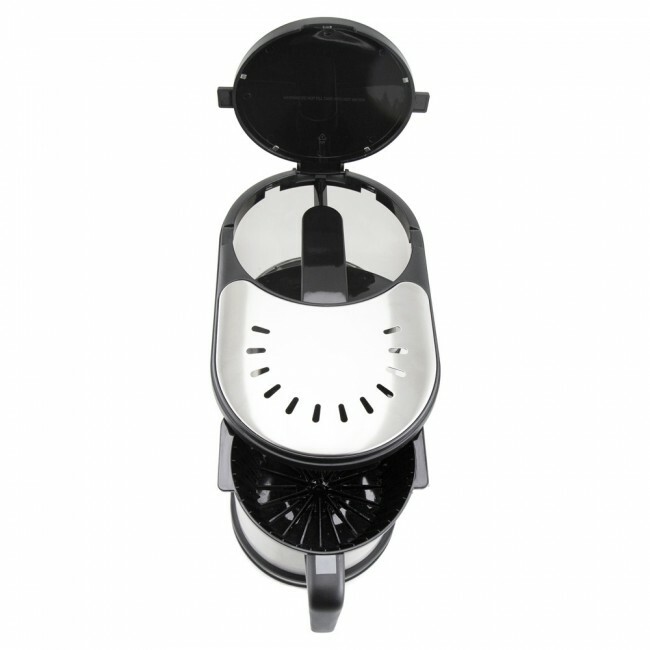 Simple Quality - Easy one-switch operation and minimal programming or options is a joy when all you want is a fresh cup on early mornings. Steel Case - The brushed steel and black case matches most kitchens and is easy to clean. No Drip Stop - The inclusion of a drip stop—even a manual one—would have been a nice addition. 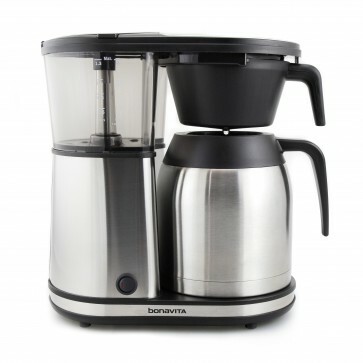 The Connoisseur is Bonavita's new SS carafe brewer, alongside the Metropolitan—a cheaper entry with a glass carafe. For all-day heat retention, pre-heat the carafe by running a half-reservoir of water before your pot of coffee. Bonus: you get a piping-hot rinse-out of your carafe—we all know you left some dregs from yesterday. Wash out carafe after every use. Descale every 2 to 3 months; or use filtered water as needed. Wipe down the case with a clean rag as needed.